Just a quick post to wish you all HAPPY HOLIDAYS! I wanted a cute card to send to my niece this year because it's her first Christmas in her own apartment. I pulled out some memory box stamps and BasicGrey papers and came up with this card. The santa hat and the tag the penguin is on were mounted with pop dots. I am happy to report that I put my Christmas cards in the mail this past Saturday so I could check that off of my list of things to do. Then we spent all day on Saturday shopping and finished most of it. Sunday morning I wrapped gifts and then we were off to our first family holiday gathering. May your day be stress-free as you prepare for the holidays! Last week I introduced you to Marti from InStyle Stamps and this week I have Ginger for you. I colored her with a combination of copics and prismacolor pencils. The card base is textured Kiwi Kiss with some BasicGrey paper on a white mat. The image panel was cut out with my nesties and then mounted with pop dots. Behind the image panel is a scalloped circle frame. To make the frame I cut out the scallop circle with the larger scalloped nestie and then took the next size down and ran it through again. Ginger and all her friends are available at InStyle Stamps. Thanks for stopping! Today's card is just a simple birthday one using a chickadee image that was sent to me in a RAK. I colored the image using the gamsol/prismacolor pencil technique. The card base is Kraft and the mats are True Thyme. Let's take a little break from Christmas cards and share a birthday card. For this card I started with a stamped image of the cowboy from Bronc Buster that I received in a RAK. It was stamped in brown on white cardstock so I pulled out my Antique Linen Distress Ink and dragged it down the image like when doing the faux linen technique. Next I sponged the edges with Vintage Photo Distress Ink. I did the same treatment to the Birtday tag. Both of those pieces were matted with True Thyme. The designer papers are from BasicGrey and the card base is Kraft. The twine wrapped around the front is from PinkHedgehog Paper Crafts. Ok, here are a couple more Christmas cards I made after discovering I didn't have enough to send out. The trees are from the SU retired Sparkling Season set. I embossed them in gold and bronze, cut them out and mounted them with pop dots. A very simple layout but I like the effect of the embossing and the gold cording and ribbon. I stopped and bought stamps and addressed most of the envelopes so I'm hopeful that I will get them in the mail before Christmas. Yeah! Thanks for stopping. So I finally sat down to work on updating my address list and get started on addressing our cards only to discover that I hadn't made nearly enough cards for the number of people on the list. Gee, when did our Christmas card list get so long. . . Anyway, I needed more cards so I pulled out one of the Studio G $1 sets and stamped the stocking several times with Palette Hybrid Black on white cardstock and then colored them in with my copics. I added distress stickles to the stockings too. Here are a couple of the cards I put together rather quickly. 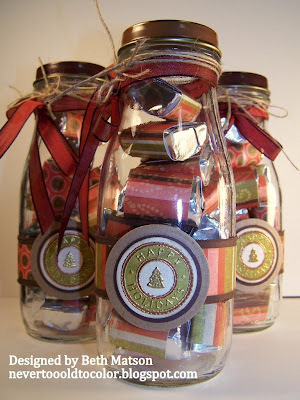 This one uses papers from the K&Company Christmas Cheer pack. I also used the SU scallop border punch. The card bases are wonderful textured natural (cream) colored cardstock I purchased from InStyle Stamps. For this card I used a variety of BasicGrey papers. Thanks so much for stopping by. I hope you're able to take some time to relax and enjoy yourself during this busy season. 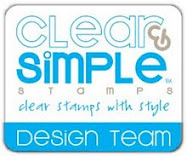 I am so excited to announce that I was invited to be a guest designer for a new stamp company InStyle Stamps! Their first seven images are now available on their site so be sure to check them out. If you make a purchase between now and December 19th, 2008 you will be entered in a drawing for a box full of wonderful eye candy. You can see the details here. For today's card I chose to work with Marti. I colored her with copics and then I pulled out my glitter and Quickie Glue Pen because I thought she needed a sparkling evening dress. I also added glitter to her necklace. Inside it reads, "40 and fabulous" for my girlfriend who is turning 40 this month. Don't forget to check out the new InStyle Stamp site and remember, every purchase through December 19th enters you in the drawing for a box of goodies. It's a cold one here today, -15 currently with a possible high of 0 (zero). I hope you're all staying warm wherever you are. Thanks for stopping by. 'Tis the season for bringing wine to the hostess of your holiday party and what better way to present it than with a handmade tag draped around the neck of the bottle. I used a long scalloped rectangle nestie for my tag. I cut out 1 layer of chipboard and two layers of BasicGrey paper to cover the front and back of the chipboard layer. The front was stamped with SU Lace Snowflakes in Walnut Stain Distress Ink. Then I used my crop-o-dile to add eyelets to the top for threading my wire through. Before attaching the handle to the main tag, I added the cheers tag. The verse is from Papertrey Ink and stamped on white with more Walnut Stain Distress Ink. The edges were sponged with Vintage Photo Distress Ink and a blue border was drawn on with a Stampin Write marker. The cuttlebug snowflakes were made out of chipboard and painted with SnowCap Ranger Paint Dabber. Once they were dry, glitter and a jewel were added. I think the hostess at your next party would be thrilled to receive this. 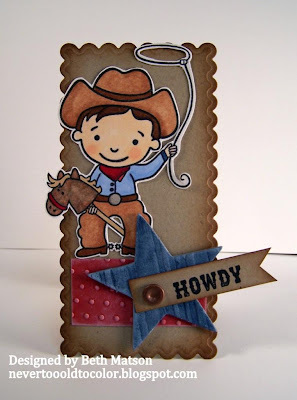 I have these wonderful cowboy diecuts that I bought from Deluxe Designs before they went out of business last year and I thought it would be fun to use one for a Christmas card. The papers are from BasicGrey and the edges are sponged with Vintage Photo Distress Ink. The red snowflake is a punch and the larger kraft snowflake is a cuttlebug die. The cuttlebug snowflake was covered with peeled paint distress stickles and Diamond Dust. I decided to make another holiday card for the Clear & Simple Stamps challenge on Paper Craft Planet. If you would like to join us, the information can be found here. 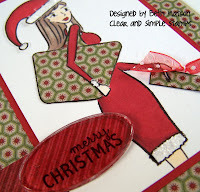 Again, I used my long scalloped nesties for my card base. Here is a photo of the back so you can see that I left the fold inside the nestie when I ran it through my cuttlebug and then ran a complete piece through and attached it for the front. I made the base out of Kraft but then decided I wanted my front black so the base has a layer of Kraft visible from the back and black visible from the front. I think it gives it a nice finished look. 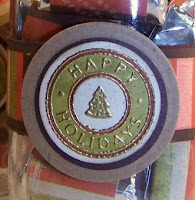 The patterned paper is from K&Company and the ribbon is from May Arts. I hope you don't mind another Party Farm Animals card today. I'm having so much fun with this set. The base of this card is Kiwi Kiss and the patterned papers are from the Urban Prairie pack from BasicGrey. A little vintage rick rack from my stash attached with staples and then the image panel. The image was stamped with Archival Jet Black on Vanilla and colored with copics. I sponged the edges with Vintage Photo distress ink and mounted the panel with pop dots. There's no sentiment on this card yet because I haven't decided who I'm going to send it to. Happy Friday! Thank you so much for stopping by. I hope you have a wonderful weekend. After making the round nestie card the other day I was inspired to make a long scalloped rectangle card. For the card base I folded a piece of Kraft cardstock and ran it through my cuttlebug with the scallop rectangle nestie leaving the fold out of the nestie. Then I ran a complete rectangle of Kraft through my nestie and embossed it. This was then glued to the card base so the front side of the rectangle is complete. I sponged the edges with Vintage photo distress ink to help accent the embossing. Next I stamped Billy from Pink Cat Studio, colored him with copics and cut him out. The strip of Riding Hood Red was run through the cuttlebug with the swiss dots folder and then brushed with a white craft inkpad to highlight the dots. The edges of the panel were also sponged with the white. The grungeboard star was colored with a copic and then hit with a heat tool before dragged it across the white craft inkpad to lighten it up a bit. 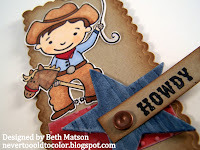 The little HOWDY tag was attached to the star with a large eyelet. I discovered a few empty frap bottles in a drawer and decided to give them some new life. I didn't have any Kisses but I did have Nuggets so I pulled out some My Mind's Eye papers and covered the Nuggets before putting them in the bottles. The Happy Holidays image from SU Riveting (retired hostess set) was embossed in gold on Very Vanilla and then colored with copic markers. A little sponging with Vintage Photo Distress Ink was added to tone down the vanilla a little bit and give it a more aged look. They were then layered on chocolate chip and kraft for the tops and the labels. The ribbon is from May Arts and the twine is from Pink Hedgehog Paper Crafts. Thanks so much for stopping. I hope you're having a wonderful day. 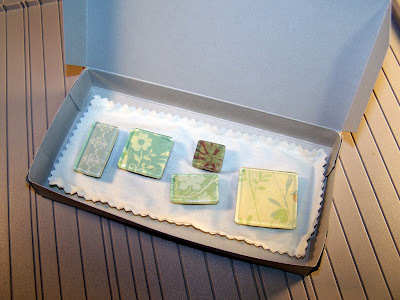 Ok, I have had some requests for the box pattern for the magnet sets that I posted last month but I couldn't find my template so I pulled one of the boxes apart and took some pictures and measurements. Cut a piece of cardstock 8 x 7 1/2. Score 3/4 of an inch in from either end on the 7 1/2 inch side. Now working on the 8 inch side we're going to make 4 score lines - 1) score 3/4 of an inch from one end, 2) 3 inches over from the first score line, 3) 3/4 of an inch over from the second score, 4) another 3 inches from the last score line. That should leave you with panels that measure 3/4 inch, 3 inch , 3/4 inch , 3 inch and 1/2 inch. And again, with the magnets inside. I hope you find this helpful. If you have any questions, please leave a comment and I will try and answer them. Thanks for stopping! This week's color challenge on Splitcoaststampers is Sahara Sand, Very Vanilla and Basic Black (CC195). I decided to make a Christmas card for the challenge so I pulled out my retired A Beautiful Season set and got to work. 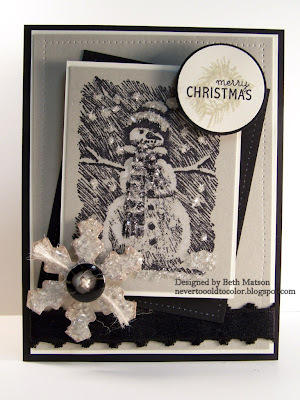 The snowman is stamped with Archival Jet Black ink on Sahara Sand then layered on Very Vanilla. Next I made a mat of basic black but decided to off-set that layer. The card base is black with mats of vanilla and sand. Before assembling the card I added some glossy accents to the snowman image and sprinkled it with Diamond Dust. The pine cone image behind the greeting was stamped with Aged Paper Distress Ink because I don't have sahara sand ink. 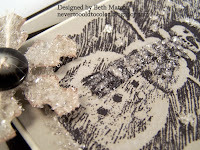 The snowflake punch was also covered in glossy accents and Diamond Dust. "On the fifth day of Christmas, my true love gave to me Five GOLDEN Rings"... Paper Craft Planet is having a 12 Days of Christmas challenge. Each day brings a new challenge and this card is for the Fifth Day of Christmas with the challenge to create a card that is round or has circles/rings. The card base is SU Kraft cut out with the largest scalloped circle nestie. I ran it through my cuttlebug leaving the top three scallops out of the nestie to allow for the fold. Next I cut out another complete scalloped circle and glued it to the case base so from the front the scalloped circle is complete. 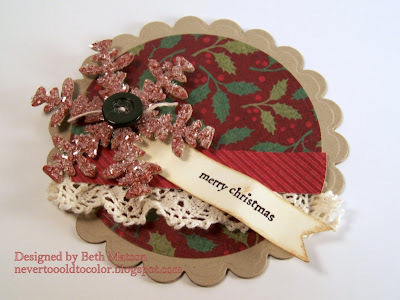 Next I used the plain circle nestie with some K&Company Christmas Cheer paper. I added a strip of lace and another strip of K&Company paper. Then I stamped Merry Christmas with Archival Jet Black on a strip of SU Very Vanilla and inked it with some distress inks (vintage photo, old paper). The cuttlebug snowflake is covered in fired brick distress stickles and Diamond Dust. 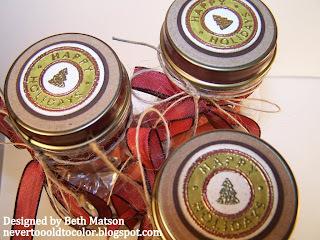 The challenge was issued on Paper Craft Planet to create a holiday card using Clear and Simple Stamps so I got to work. Here's the information if you would like to join us! I pulled out my Jet-Setter Darling set and stamped her in Archival ink on white. I drew the cuffs on the sleeves, cuffs on the bottom of the dress and the leg with my copic multiliner and then colored the image with copics. Next I drew a santa hat on a scrap then cut it out and attached it to cover the sunglasses in her hair. Her bag and gift were paper pieced with K&Company Christmas Cheer paper. I also added some ribbon to the gift she's holding. Crystal Effects and Diamond Dust were added to all of the trim on her hat and dress for some added sparkle. 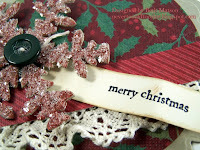 The Merry Christmas was also stamped with Archival ink and then attached to a fragment with Crystal Effects. 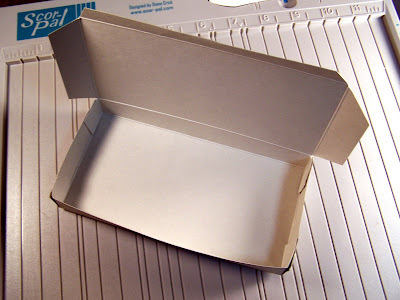 The card base is made from Kraft card stock and is 4 1/4 inches square. The Scor-Pal Christmas Magazine is now available for viewing at Scor-Pal. You may even notice that am listed as a guest instructor. I am happy to report that I was asked to contribute back in July after posting some cards featuring handmade patterned paper using my scor-pal. Diana asked if I would make a holiday card for the tutorial so here it is. If you're interested in seeing the other posts. Here is a link to my original post; the second post and the third post. 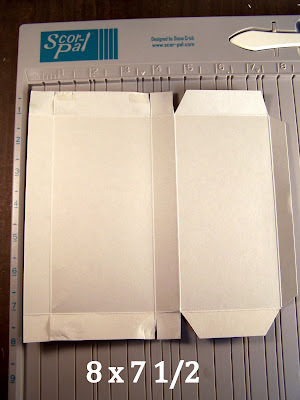 All of these posts show samples of patterned paper made using this technique. I hope you all had a wonderful Thanksgiving. I spent it in bed with a terrible cold so I was very thankful that we weren't entertaining this year. It was so nice to have the long weekend to lay around and get better. 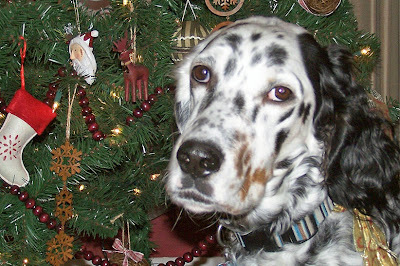 Unfortunately that means no Christmas decorating was accomplished yet but there's still time. I have a lot of my Christmas cards done already which is a really nice feeling! Thanks so much for stopping.